When we think of anchovies, the first thing that comes to mind is … ikan bilis. In South East Asia, we usually fry these small fish and eat them with nasi lemak, with a generous dollop of sambal (prawn paste chilli) on the side. I didn’t want to make a savoury treat because that would have been so … easy. I wondered if I could make a cupcake that would remind people of nasi lemak albeit with a dessert twist. And, as if someone had read my mind, Ette Tea created a Nasi Lemak tea recently. I knew I have the stuff to work on to make my nasi lemak cupcake. The first thing to do is extracting that nasi lemak flavour from Ette Tea’s loose leaf tea. To do that, I mashed 110g of unsalted butter with 4 teaspoons of tea leaf, and left the mixture inside the refrigerator overnight. Then, I squashed the tea leaf-covered butter through a sieve to separate the fat from the leaf. 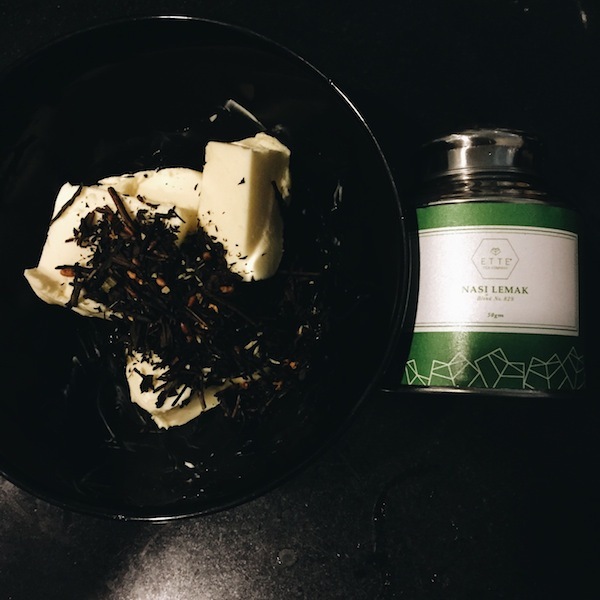 Flavour the butter with Ette Tea’s Nasi Lemak Tea. 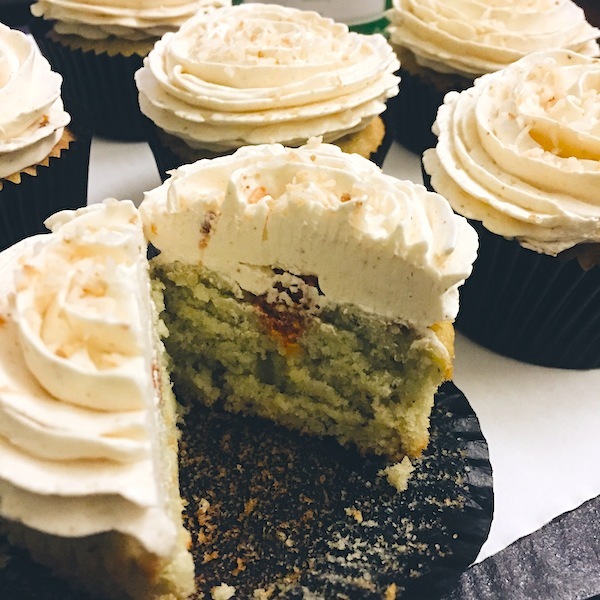 Knowing that most people would feel “weirded out” eating a “savoury food” as a dessert, I was careful with the amount of “core” I injected into my cupcake. To create the flavour core, I mixed 2 tablespoons of Paper Crane’s fiery chilli sauce with 2 teaspoons of the anchovy paste from Steph and Kelvin. Pipe this mixture into a bag and set aside in the refrigerator. Pipe a button-size dollop of the flavour core into the each cupcake. Nasi lemak in its very basic is coconut-flavoured rice eaten with sambal, cucumber, ikan bilis, peanuts, and fried fish. 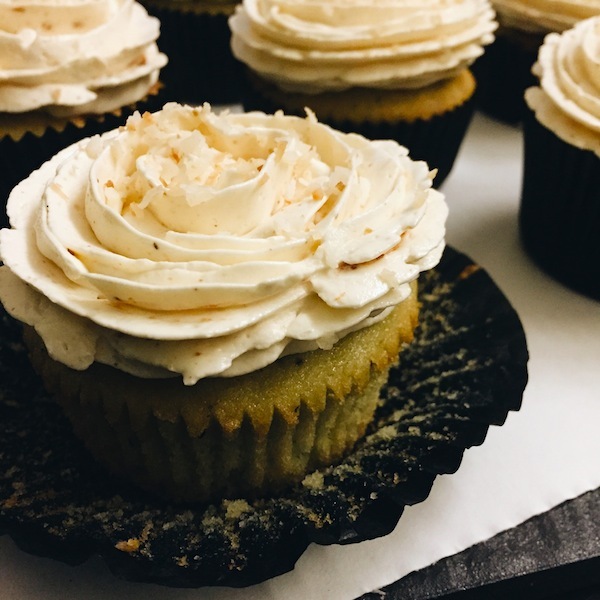 I thought about making a cucumber-flavoured buttercream but went with a peanut-flavoured one in the end to give the cupcake a more “rounded”, indulgent taste. Now that I’ve got my cupcake “designed”, let’s proceed to make it! 1/2 cup milk. Mix 1 tsp coconut essence and a bit of green food colouring into it. 1. Line your 12-cupcake muffin tray. 2. Heat your oven to 165C. 3. Beat sugar and butter until pale and fluffy. 4. Beat in eggs one at a time. 5. Alternately add flour and milk into the wet mix. 6. Distribute the batter into cupcake liners and bake for 18 minutes. 1. Dissolve sugar in whites in a bowl placed over boiling water. 2. Heat till mixture reach 60C. 3. Once whites cool down to room temperature, beat until you achieve stiff, white peaks. 4. Turn mixer to low speed and add butter piece by piece. 5. Beat until you get buttercream and mix in the peanut butter. 6. Scoop into a piping bag with a nozzle affixed at the end. 1. Using a corer, cut out a small hole in each cupcake. 2. 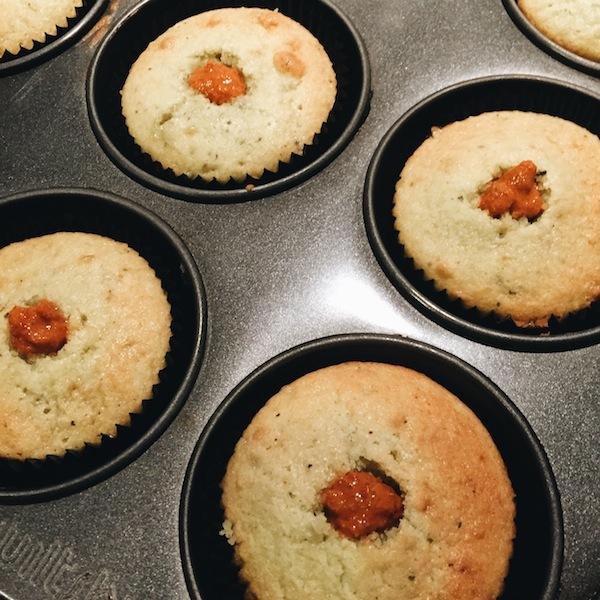 Pipe a button size dollop of sambal-anchovy flavour core into the cupcake. 3. Pipe the peanut buttercream over. 4. Decorate with toasted coconut, if desired. Don’t feel too weirded out … the core adds just the right amount of heat and ikan bilis flavour to it. Like most people, I approached this cupcake with my fair share of trepidation. I wondered if I had created a monster. Then I took my first bite and I found myself blown away! The whole thing tasted like NASI LEMAK! The sambal core added just a teeny tiny bit of heat and ikan bilis flavour to the thing without making the dessert taste weird. The whole thing was a heady combination of coconut, ikan bilis, peanut and chilli … but without the oiliness and “fried” taste of the Malay rice dish. Take my word for it, it’s really quite nice. 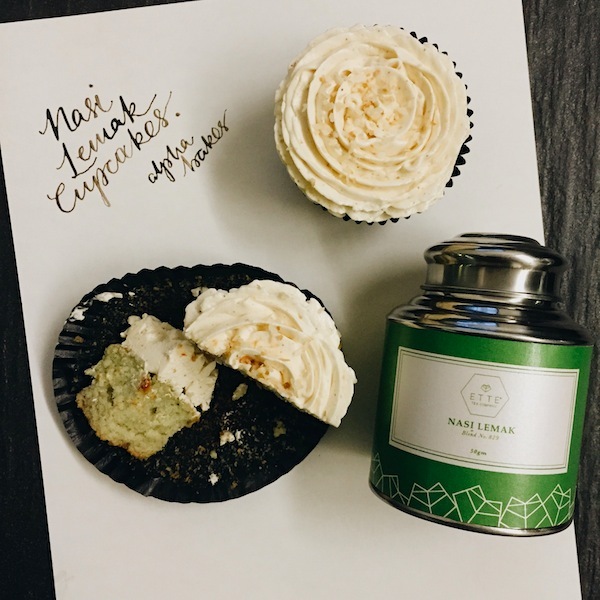 Combining my 3 loves – calligraphy, baking and tea. Sorry for the late reply! You can buy Ette Tea from Naiise or http://www.ettetea.com.